Any Seinfeld fans in the house?!? Yes….no……..maybe……well I’m doing this anyway. If you’ve watched Seinfeld around the holidays, you’ve probably seen the Costanzas celebrate Festivus. 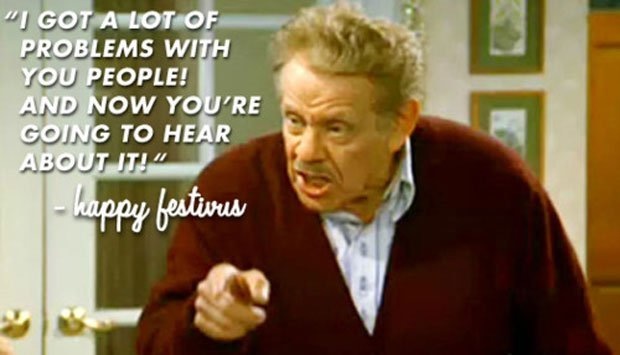 Festivus was apparently the brain child of the father of Seinfeld writer Dan O’Keefe, and the O’Keefes started celebrating the holiday in 1966. I have no idea what year my father discovered Festivus, but I do know that we did celebrate it one year….complete with a metal pole in the middle of the living room. 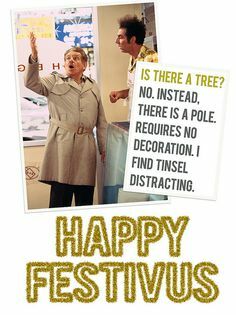 Ahhh, nothing like a Festivus of the rest of us! My Dad hated decorating for Christmas…..particularly the lights. This is extra fitting. 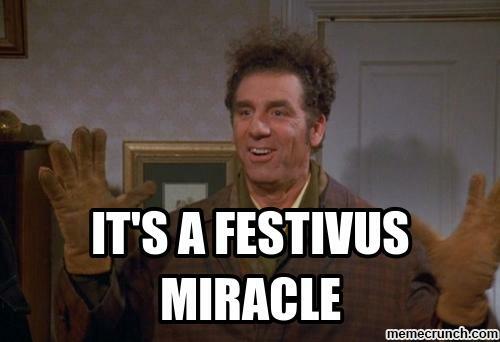 Festivus is comprised of several activities: the declaration of Festivus miracles, the feats of strength, and the airing of grievances. I’ve decided to take advantage of the time of year to air some personal grievances. These will be related to recent dates I’ve been on, people I’ve seriously attempted to date, or just people who’ve annoyed me lately. They aren’t really involved enough to demand their own chapters, but they are dudes that you might want to hear about. This is the guy that many of you asked about when I said a few weeks ago that I went on a date. Short story long……the date did not have the desired effect. I really don’t know why, and honestly I don’t really care. But this is what I don’t understand…… Why dude, would you kiss me in the parking lot if you didn’t want to see me again!? Now say what you will about kissing people in parking lots…..that’s a different issue. I’ve been on plenty a date where I didn’t want to see the person again. Just cut your losses and leave dude! Don’t be all confusing with the signals…… I shouldn’t have to consult friends post date to figure out what it is you were trying to accomplish! I don’t even know where to start with this one. Honestly, this has been going on since January, and he could probably be his own chapter. I might do a whole chapter on him in the future, but for now I’m angry and annoyed and this is what I’m doing. This one is short and sweet and should not be confused with the Firefighter Cowboy from Chapter 1! Random guy who lives in the Hills starts talking to me on Tinder. This leads to him calling me to chat. During one of our chats he starts fighting with me about how horses are so much better for moving cattle than 4-wheelers………and this is his life………and “They’ve done studies…you’re into science you should understand that!” hahah…..yup cuz being a jerk straight outta the gate makes me wanna date you sir. Shame though, he’s 6’4″ and smokin’ hot! Yea….obviously Tinder isn’t the way to go about this. Dude….if you make plans with me and then don’t remember when I ask about it…….don’t expect me to call you. I’m not that desperate for a guy. I’m not hanging out with you after you done “meeting the guys for beers”….. This actually has nothing to do with a guy I even know, just some random who I encountered on my drive home Tuesday night. I’m sorry sir that you have having some sort of crisis in your life….but rolling around with the top down, in a man tank, blasting TI’s Whatever You Like is not the answer!! Also, don’t be that creepy dude singing “I want your body, need your body” to girls at red lights……just…..don’t…… It’s weird, we don’t like it, and it’s certainly not gonna make me want to get in your car.